Please note the holiday hours for certain CFD products on July 3 and 4. All times are in GMT. 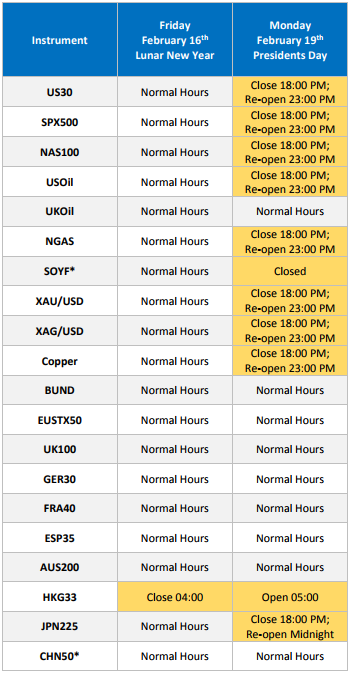 There are no changes to forex trading hours. You can create contingent orders by right clicking on a symbol and selecting “Create Contingent Order” from the menu. You can also press Alt+E on your keyboard. The online user guide has more information on how each order type works. A new Statement Summary Report is now available. This new report is designed to give you a summary of all products traded over a specified period along with volume, gross P/L, commission, rollover, net P/L, and open/close date. The previous Combined Account Statement Report is still available which will give details on every trade for the specified period of time. You will also notice when selecting the report type you also have the option for ‘Account Analytics’. This option will take you to the Trading Analytics app where you can run detailed analysis of your trading history such as profitability by symbol, profitability by time of day, average gain per trade, average loss per trade, and much more. The Bid/Ask price panel is now available directly on the chart for trading. Previously, you could trade from the chart by clicking on the price on the right hand axis. The price panel now gives you an additional method to place trades, plus a drop down menu for you to select the amount to trade if you have the platform set to one-click trading as I have done in the screenshot. Let me know if you have any questions, and as always we appreciate any feedback you have about the update. These are great additions, Jason. I still find MS2 to be the most flexible, comprehensive and trader-friendly platform (and by far!) that I have ever used (which admittedly is not many!) I really like the new price panel on the MS2, it is very useful - but it could be like on MT4 and offer the choice of toggling it on and off. Actually, I still like the fact that you can drag/drop the price panel from the Tradestation and then it is always “on top” even when one is working on other things like spreadsheets. That enables you to keep one eye on prices at the same time as doing other things. The only thing I would like to see that would improve chart visibility would be to have an option to colour the candle outlines separate to the body colours. E.g. a black outline with, say, green and red bodies - but I guess that is a bit picky!!! Happy to hear you are enjoying using our Marketscope platform. That’s a great suggestion about the candlestick outline and I’ll give this feedback to the development team. Technically, it is possible to change the outlines if you would like to create a custom indicator. The price panels can be removed from either all charts or just some. If you right click on the price panel, you can deselect “Show Price Panel” for each chart individually. You can also remove the price panels completely by going to the top of your Trading Station 2 and selecting System > Options > Marketscope 2.0 > Chart View Options > Show Price Panel > No. Great! Thanks Jason for your quick and detailed reply! FXCM Group, the two remaining forex, CFD and spread betting units of Global Brokerage, announced it is terminating the Management agreement with Global Brokerage Holdings, LLC (GLBR). According to FXCM’s statement, the termination was mutually agreed by the parties and reflects the continuing separation of FXCM from Global Brokerage. GLBR came into existence earlier this year, after FXCM Inc. was transformed into Global Brokerage Holdings. The change was in order to prevent customer confusion after the US subsidiary shut down. Tuesday we held part 1 of our 3 part webinar series on Algo Trading. If you’re new to algorithmic trading and looking to automate a trading strategy, this is a good way to get started. Normally, the forex market trades 24 hours a day, 5 days a week without interruption even during major holidays around the world, and FXCM provides live customer support 24 hours a day even on weekends and holidays. However, Christmas and New Years are the two exceptions. 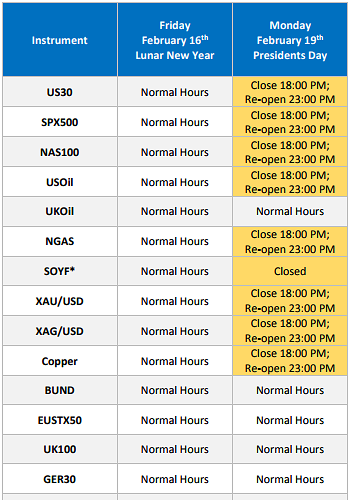 Here is a link to FXCM’s holiday hours for trading and customer support during these holidays. I’ll be out of the office until January 3rd and will respond to any posts or private messages when I return. Please note the February holiday hours for CFD products. All times are in GMT. 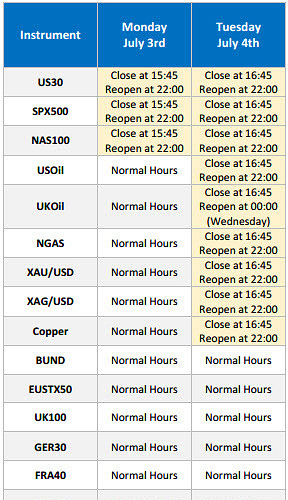 There are no changes to forex trading hours. *This product is at its initial launch phase and currently only available to accounts held with FXCM Markets and FXCM Australia under certain servers. When will FXCM launch crypto CFDs? Thanks for the question. I know everyone has been eager to trade crypto CFDs. We don’t have any information to share at the moment, but I will let you know if and when that changes. That didn’t sound like a “no” to me. It has come time to look for a broker for my first live account. So im searching on several sites and have have always thought one of the proper places to research Forex questions is here on BabyPips.One of the brokers ive always heard about is FXCM. So i saw this discusion about the broker. So i thought it would be respectful to research this broker on the BROKER DISCUSSION thread. I received a e-mail notice that you posted this as a reply to me. Jason is the FXCM official representative on BP and I am sure he will be more than happy to answer any queries you have regarding FXCM. Please feel free to use this thread to post any questions about FXCM. i’m new, can we start trading on fxcm with just $500? Welcome to the forum. Yes, you can open an account with $500. The first step is to submit the application on our website, and then you deposit funds online through our website and start trading. A Python Wrapper was also released. Easily integrated with Jupyter Notebook, fxcmpy is a Python package that exposes all capabilities of the REST API via different Python classes. The classes allow for a convenient, Pythonic way of interacting with FXCM’s REST API on a high level without needing to take care of the lower-level technical aspects. Documentation including sample code and real case studies can be found on our Github page. Let me know if you have any questions. What is with the IO2GOfferRow volume (Vol=) ? Every minute starts from close to zero, and always increments. Are those full lots or ticks or what? It’s not mentioned in the ForexConnect doc. Is there any way to get the volume separated long and short instead of like this? Here is a sample from this morning. IO2GOfferRow volume in your sample is showing the tick volume of the current minute. Ticks are the number of times price has changed in the current minute which is strongly correlated to volume traded. Also, there is not a way to separate tick volume into long and short tick volume.